Google Analytics v5 was released last month, which included several new and valuable features. For example, tracking events as conversions, custom dashboards, cross channel tracking, etc. That said, there is one new feature that hasn’t gotten much press, but is very handy. It’s called Plot Rows and enables you to easily trend rows of data with a click of a checkbox. If you use Google Analytics on a regular basis, you’ll find that plot rows can be an extremely helpful tool for viewing trending without having to drill further into your reporting. In this post, I’m going to cover what it is, how you can use it, while showing several examples of it in action. My hope is that you can start to use plot rows during your own analysis today. When you access reports in GA, the trending graph at the top of the screen typically provides trending for a default metric in the report you are looking at. 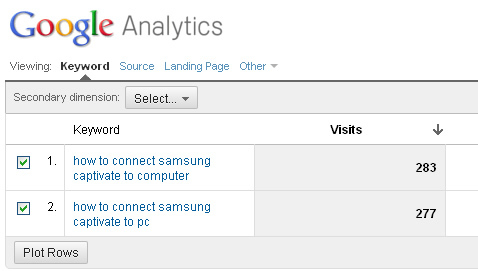 For example, while viewing search traffic, you’ll see trending for visits over the time period selected. But what if you wanted to quickly see Google versus Bing or Yahoo versus Bing? In order to get this trending, you would have to use advanced segments or drill into each traffic source. But, with the latest version of Google Analytics, you can now use plot rows to see trending for any two rows of data from nearly any report. Using our example from earlier, you could click the checkboxes for both Google and Bing to view trending over time. See the screenshot below. Awesome. Note: The checkboxes are located to the left of each row, and the “Plot Rows” button is located at the bottom of the report. Again, if you are analyzing website traffic and performance on a regular basis, this can be a great tool for you to utilize. But, plot rows functionality doesn’t only apply to visits. You can trend any metric available in the graph using plot rows. For example, want to trend conversion rate, bounce rate, or ecommerce revenue for specific traffic source or keywords? You can. This will enable you to analyze specific rows of data on the fly. 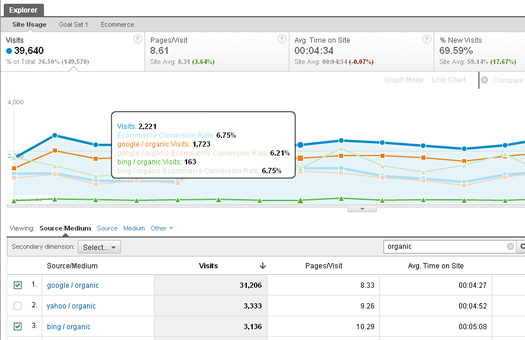 View the screenshot below of trending both visits and ecommerce conversion rate. Once you use plot rows, you might find some interesting trending and choose to further analyze that data using more advanced techniques (like advanced segments). For me personally, plot rows has enabled me to quickly analyze various rows of data, which has helped me glean insights from that data, and then dig deeper. And that’s what analytics is all about. If you are analyzing search traffic and want to trend various keywords that have driven traffic recently, then plot rows can also come in very handy. Without plot rows, you would have to drill into each keyword in GA to view trending. Now you can tick the boxes next to those keywords and click “Plot Rows” at the bottom of the report to immediately see trending in your reporting. And again, it doesn’t have to be just visits. It can be revenue, bounce rate, etc. Since you will be comparing each keyword to the total traffic level in GA (for now), scale can become a problem. For example if two keywords only drove a small percentage of traffic, then trending them using plot rows could lead to a graph that is tough to view and interpret. In this situation, it’s best to use advanced search to view a group of keywords and then plot rows against a subset of those keywords. For example, filter all keywords with the word “sneakers” in them and then plot rows for adidas sneakers and nike sneakers. The resulting trending graph will be much easier to decipher. See screenshot below where I am viewing the trending for visits and bounce rate for two keywords. Whether you are neck deep in analytics every day or quickly digging into a report for your next meeting, plot rows can help you quickly view trending for specific rows of data. Although there are some big changes in the latest version of Google Analytics, don’t overlook some of the smaller, but helpful ones. Plot Rows is one of the smaller changes, but it’s one that can help you quickly analyze your traffic at a more granular basis. It’s a great stepping stone to deeper analysis.